I often make the following recipe into waffles ahead of time, freeze them and then thaw & reheat them again in the waffle iron for about 40 seconds. They are just as good as freshly made! It is a quick lunch when we come home and need lunch in a hurry or great when someone comes unexpectedly. By using the potato peels as well one is getting the peel’s fibre & nutrients! Blend the eggs and onion. Coarsely shred the diced potatoes. Mix in the egg mixture & yogurt. Add dry ingredients and mix well with a spoon. 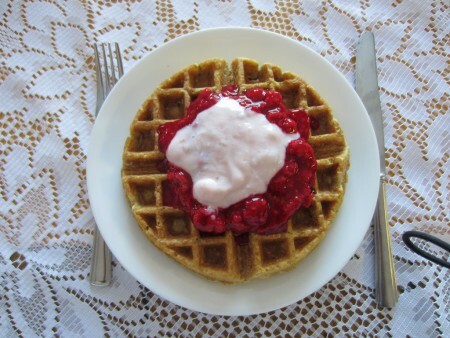 Fry in coconut oil for pancakes or in the waffle iron until nicely browned.